Rome is known for historic sites, museums, nightlife, shopping, and classes. Your plan includes some of its best attractions: contemplate the long history of St. Peter's Basilica, admire the local landmark of Trevi Fountain, delve into the distant past at Colosseum, and make a trip to Spanish Steps. For ratings, reviews, maps, and more tourist information, go to the Rome driving holiday planner. New Delhi, India to Rome is an approximately 11.5-hour flight. You can also do a combination of flight and train. Traveling from New Delhi to Rome, you'll gain 4 hours due to the time zone difference. Traveling from New Delhi in June, expect Rome to be slightly colder, temps between 34°C and 21°C. Wrap up your sightseeing on the 15th (Fri) to allow time to travel to Ravello. Ravello is a town and comune situated above the Amalfi Coast in the province of Salerno, Campania, southern Italy, with approximately 2,500 inhabitants. 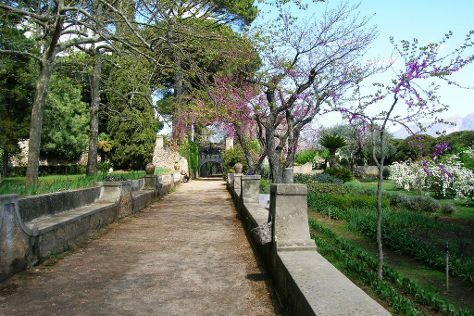 Kick off your visit on the 16th (Sat): contemplate in the serene atmosphere at Duomo di Ravello, take in the spiritual surroundings of Duomo di Sant'Andrea, then admire the striking features of Villa Rufolo, and finally admire the natural beauty at Villa Cimbrone Gardens. To find more things to do, where to stay, reviews, and tourist information, read Ravello attractions site . You can do a combination of train, subway, and taxi from Rome to Ravello in 3 hours. Alternatively, you can drive; or do a combination of train and bus. Traveling from Rome in June, you will find days in Ravello are little chillier (30°C), and nights are a bit warmer (26°C). Wrap up your sightseeing on the 17th (Sun) early enough to travel to Florence. Step out of Florence to go to Greve in Chianti and see Montefioralle Winery, which is approximately 1h 05 min away. The adventure continues: admire the masterpieces at Uffizi Galleries, contemplate in the serene atmosphere at The Baptistery of St. John, see the interesting displays at Galleria dell'Accademia, and get great views at Piazzale Michelangelo. To see ratings, other places to visit, more things to do, and other tourist information, use the Florence trip planner. Traveling by combination of taxi and train from Ravello to Florence takes 5 hours. Alternatively, you can drive; or do a combination of bus and train. Traveling from Ravello in June, Florence is slightly colder at night with lows of 18°C. Wrap up your sightseeing on the 20th (Wed) to allow time to take a train to Venice. Kick off your visit on the 20th (Wed): snap pictures at Ponte di Rialto, take in the architecture and atmosphere at Basilica di Santa Maria della Salute, explore the activities along Canal Grande, then admire the masterpieces at Museo Correr, then admire the striking features of Basilica di San Marco, and finally steep yourself in history at Doge's Palace. Here are some ideas for day two: admire the masterpieces at Gallerie dell'Accademia, snap pictures at Ponte dei Sospiri, then enjoy breathtaking views from St Mark's Campanile, then contemplate in the serene atmosphere at Scrovegni Chapel, and finally take in the architecture and atmosphere at Basilica di Sant’Antonio. To see photos, ratings, more things to do, and other tourist information, read our Venice route builder site . Take a train from Florence to Venice in 2.5 hours. Alternatively, you can drive; or take a bus. June in Venice sees daily highs of 32°C and lows of 20°C at night. Finish up your sightseeing early on the 22nd (Fri) so you can travel to Zurich. Start off your visit on the 22nd (Fri): wander the streets of Old Town (Altstadt) and then explore the activities along Lake Zurich. Get ready for a full day of sightseeing on the 23rd (Sat): contemplate the waterfront views at Lake Lucerne, take in the views from Chapel Bridge (Kapellbrucke), then pause for some photo ops at Dying Lion of Lucerne Monument, and finally take your sightseeing to a higher altitude at Mt Pilatus. To see where to stay, other places to visit, and tourist information, you can read our Zurich road trip planning tool . Getting from Venice to Zurich by flight takes about 4 hours. Other options: drive; or take a train. In June, Zurich is slightly colder than Venice - with highs of 27°C and lows of 15°C. Cap off your sightseeing on the 24th (Sun) early enough to go by car to Interlaken. On your second day here, take in the awesome beauty at Harderkulm, then glide through the air with a parasailing or paragliding tour, and then indulge your taste buds at Funky Chocolate Club Switzerland. Traveling by car from Zurich to Interlaken takes 2 hours. Alternatively, you can take a train. 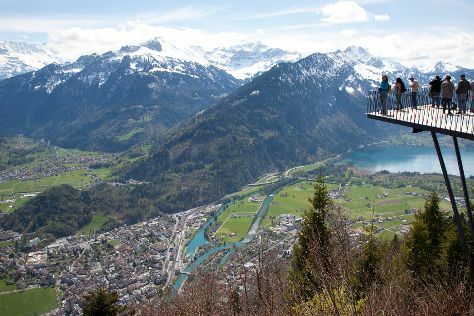 June in Interlaken sees daily highs of 26°C and lows of 13°C at night. Wrap up your sightseeing on the 26th (Tue) to allow time to travel back home.